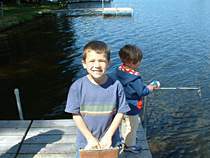 Blessed by nature, Froelich's is situated amidst towering virgin pines on the shore of Plum Lake whose clear waters beckon the angler as well as the water sports enthusiast. For those anglers, Class A Musky lurk in the waters of Plum Lake. You will enjoy our heated outdoor pool, flower garden, recreation building (pool, tv and ping pong), Great Room (jigsaw puzzles, library and piano). You will want to bring your bikes to explore the miles of trails in the Northern Highland Forest and surrounding areas. There are numerous bike and hiking trails in the area; riding stables and numerous golf courses such as Plum Lake and St. Germain nearby. 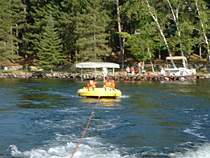 We also offer pontoon boat, canoe, and kayaks for your use. A bait shop is close by and area guides can be hired to assist you in bringing in that record-breaking fish. Little known fact: Two of the best months to visit the beautiful Northwoods are June and September. During June you'll be able to sit back and relax, free from civilization and the major tourist season. In addition, the fall foliage in northern Wisconsin is indescribable. 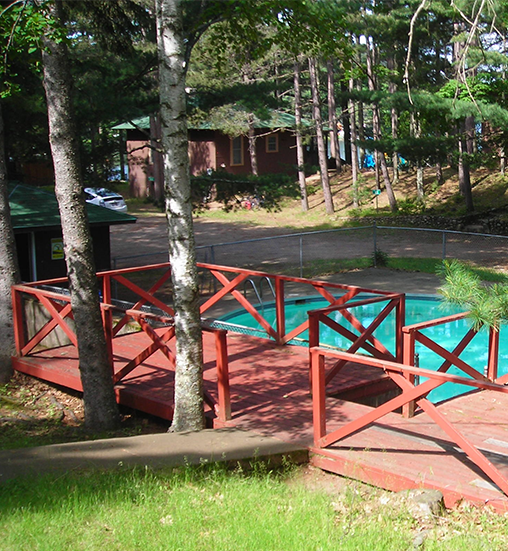 Bring your whole family to Froelich's Sayner Lodge. We have something to offer for everyone from the little guy to the big guy. For more information on the Sayner area and what it has to offer, or to make reservations, please contact us.